While most of us believed Enunwa’s disk issues in his neck surfaced last summer before surgery put his career on hold, the Jets wide receiver told the Daily News that it was a three-year erosion that finally prompted him to go under the knife. The scary image of Enunwa stumbling and falling face first to the ground after taking a step without being touched during the team’s intrasquad scrimmage last August punctuated a problem that finally was addressed three weeks later in the operating room. Enunwa admitted he was scared for about a day before doctors assured him that this wasn’t a life-altering or career-threatening injury. The comeback rate was solid. The chances of reoccurrence were low as long as he didn’t rush the healing process. Enunwa’s eight-month road back interestingly hasn’t included any post-surgical rehab. No physical therapy sessions. No intense neck stretches. Just rest. Lots of rest. “I want to be a difference maker,” Enunwa said. The 6-2, 225-pound Enunwa has the skillset to be just that in Jeremy Bates’ West Coast Offense, a chess piece with the body of a tight end and mindset of a run-after-the-catch receiver. Enunwa’s 2016 breakout season that included team highs in receiving yards (857) and touchdowns (four) to go along with the second-most receptions (58) and targets (105) set high expectations entering last season. 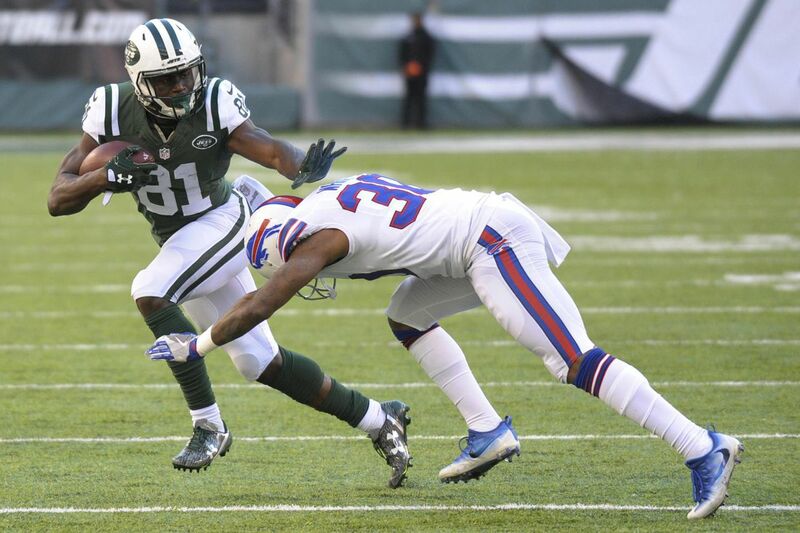 He was projected to be the Jets’ top pass catcher before tingling sensations kept him out of minicamp and his fall during the Green and White scrimmage shut him down before the preseason. His varied skillset has prompted many people to deem him a hybrid tight end, which isn’t exactly how he sees himself. Make no mistake: Enunwa isn’t a one-trick pony. He offers plenty of hidden value as a blocker in the run game. He’s proven that he can excel in the slot, where he caught 62 percent of his passes in 2016, according to ESPN Stats & Information. He even had the highest catch rate in the NFL on deep targets (passed of 20 or more yards in the air) two years ago, according to Pro Football Focus. There’s also plenty of room to grow for the 26-year-old, who needs to curtail his drops. Could Enunwa eclipse 1,200 or even 1,300 yards as an outside receiver opposite Robby Anderson in Bates’ scheme? He’s understandably anxious to remind everyone that he’s a pretty damn good football player. The wait has been excruciating. Training camp is less than two months away. It’s almost showtime. MORE MEHTA: Is WR Jermaine Kearse on the Jets’ roster bubble?